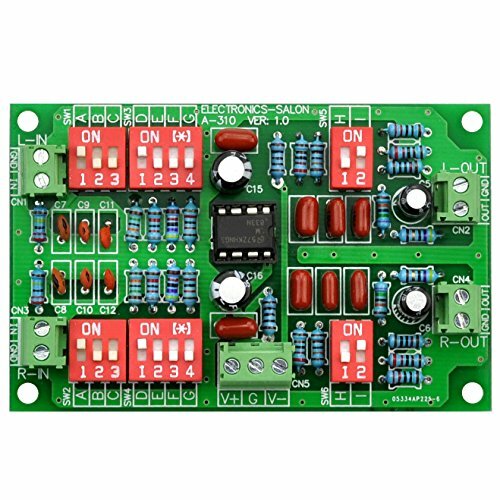 Stereo Phono RIAA Preamplifier Module Board. Thickness 1.6mm FR-4 fiber glass PCB (double layer). HQ terminal blocks easy connection wire. Low noise and low distortion audio OPAMP LM833-N. Input resistance and capacitance DIP switch selectable. Best Operating Voltage: +/-9Vdc to +/-15Vdc. Gain: 30 / 50dB, DIP switch on board option. Input Resistance: 12K to 2.2M ohm, DIP switch on board option. Input Capacitance: 0, 22, 47, 100pF, DIP switch on board option. Bandwidth: 20 to 20KHz (-3dB). SNR: >68dB (two 9V batteries supply). Size: 78 x 50 x 16mm (L x W x H). Specification: http://www.audiowind.com/pdf/A-310.pdf, no paper specifications, please download this document. Bandwidth: 20 to 20KHz (-3dB), Distortion: 0.05% (at 1KHz).